Kernel Zones bring the ability to run a non-global/local zone at a different kernel version from the global zone and can be patched or updated independently without the need to reboot the global zone. In other words, kernel zones are independent and isolated environments with a full kernel and user environment. Create and install a kernel zone using the existing zonecfg and zoneadm commands. The only difference compared to creating a non-kernel zone (the zones we have been creating for the past 10 years) is the template to be used -- by default, SYSdefault template is used. To create a kernel zone, use SYSsolaris-kz template instead. # .. continue with the rest of the steps to complete zone configuration ..
Kernel Zones can be used in combination with logical domains (Oracle VM for SPARC), but cannot be used in combination with other virtualization solutions such as Oracle VM VirtualBox that does not support nested virtualization. This release (11.2) added support for the dynamic re-configuration of local zones. Now the following configuration changes do not require a zone reboot. Recent releases of Solaris have support for Immutable Non-Global Zones already. Solaris 11.2 extends the immutable zone support to Global Zones. Immutable zones will have a read-only zone root. -r option of pkg can be used to install/update/uninstall software packages into/in/from all non-global zones from the global zone. Multiple BE support has been extended to Solaris 10 Zones in this release. This feature is useful when performing operations such as patching within an Solaris 10 environment running on a Solaris 11 system. This is not a zone specific feature per se, but including here since VNICs backed by Virtual Functions (VF) can now be assigned to a zone (including a Kernel Zone). This feature may result in improved network performance. It is now possible to allocate CMT based resources -- vCPUs, Cores and Sockets, using the existing zonecfg and poolcfg commands. This is useful from performance and/or licensing point of view as it provides flexibility and control for managing licensing boundaries or dedicating hardware resources solely to a zone. Solaris 11.2 is the first release to incorporate a complete OpenStack distribution. 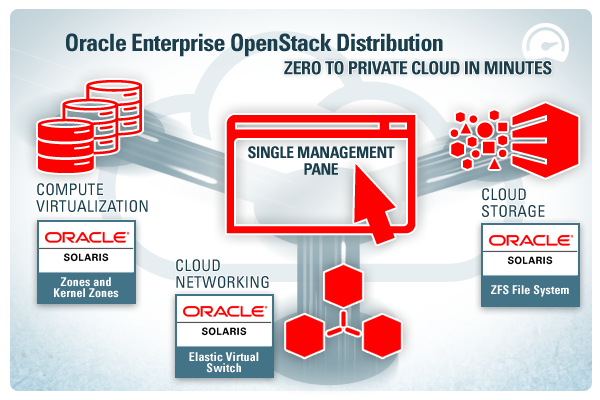 OpenStack allows managing and sharing compute, network and storage resources in the data center through a centralized web portal. In other words, now administrators can set up an enterprise ready private cloud Infrastructure-as-a-Service (IaaS) environment with ease. Unified Archives is a new native archive type that enables quick cloning for rapid application deployment in the cloud, fast and reliable disaster recovery. Both bare metal and virtual environments are supported. Check the archiveadm(1M) man page for details. For the past few years, it is one of the hot topics -- what is the bare minimum [set of packages] needed to run applications. There were a number of blog posts and few technical articles around creating minimal Solaris configurations. Finally users/customers who wish to have their OS installed with minimal set of required system packages for running most of the applications in general, can just install solaris-minimal-server package and not worry about anything else such as removing unwanted packages. Until Solaris 11.1, it is up to the users to check the package dependencies and make sure to have those installed before attempting to install Oracle database software especially using graphic installer. Solaris 11.2 frees up the users from the burden of checking and installing individual [required] packages by providing a brand new package called oracle-rdbms-server-12cR1-preinstall. Users just need to install this package for a smoother database software installation later. 11.2 provides the ability to create local IPS package repositories and keeps them in synch with the IPS package repositories hosted publicly by Oracle Corporation. The key in achieving this is the SMF service svc:/application/pkg/mirror. The following webpage has the essential steps listed on a high-level. Another enhancement is the cloning of a package repository using --clone option of pkgrecv command. A brand new command, ipstat(1M), reports IP traffic statistics. Another new command, tcpstat(1M), reports TCP and UDP traffic statistics. commands such as netstat, pfiles or lsof and proc filesystem (/proc) to extract that information. Solaris 11.2 attempts to make it easy by enhancing the existing tool netstat(1M). Enhanced netstat(1M) shows what user, pid created and control a network endpoint. -u is the magic flag. Solaris 11.2 introduced another brand new tool, numatop(1M), that helps in characterizing the NUMA behavior of processes and threads on systems with Intel Westmere, Sandy Bridge and Ivy Bridge processors. If not installed by default, install the numatop package as shown below. This is a grey area - so, just be informed that there are some ZFS and Oracle database related performance enhancements. Starting with 11.2, ZFS synchronous write transactions are committed in parallel, which should help improve the I/O throughput. Database startup time has been greatly improved in Solaris 11 releases -- it's been further improved in 11.2. Customers with databases that use hundreds of Gigabytes or Terabyte(s) of memory will notice the improvement to the database startup times. Other changes to asynchronous I/O, inter-process communication using event ports etc., help improve the performance of the recent releases of Oracle database such as 12c. Java 7 is still the default in Solaris 11.2 release, but Java 8 can be installed from the IPS package repository. Solaris 11.2 introduces the support for booting SPARC systems from USB media. Use Solaris Distribution Constructor (requires distribution-constructor package) to create the USB bootable media, or copy a bootable/installation image to the USB media using usbcopy(1M) and dd(1M) commands. Oracle Hardware Management Pack is a set of tools that are integrated into the Solaris OS distribution, that show the existing hardware configuration, help configure hardware RAID volumes, update server firmware, configure ILOM service processor, enable monitoring the hardware using existing tools etc., Look for pkg:/system/management/hmp/hmp-* packages.